Following on from the last Kerala India Travel post on suggested Kerala 1 week itineraries, here’s some ideas to help you plan your two week trip to Kerala. 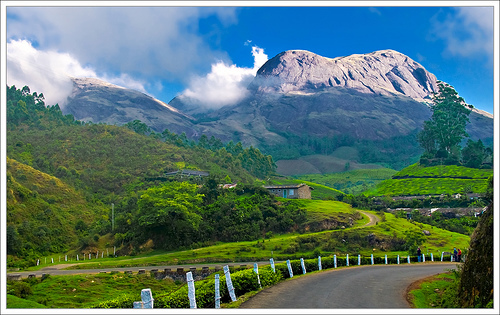 This is the classic Kerala route that takes in the most popular destinations. After exploring Fort Kochi for a day head up to the hills and wander the tea plantations in the cool mountain air of Munnar. Next spot wild elephants and monkeys (and tigers if you’re really lucky) in Periyar Wildlife Sanctuary, before taking a taxi or bus down the winding roads to Alleppey. Alleppey will be your base to explore the backwaters, stay in a homestay and take a houseboat ride. You could easily spend a week relaxing here, but if you are keen for some beach time press on to Kollam where it’s only a short ride to the dramatic beaches of Varkala. Finishing your trip in Trivandrum you’ll be able to pick up onward transport after some temple sightseeing. If you want to avoid the cooler climes of the hills then stick to the backwaters and beaches of Kerala. You’ll see many of the sights of the Kerala Highlights route, but you’ll have more time to soak up the slow Keralan pace and chill out by rivers and sea. This Keralan Coast route takes you along the 580km long Arabian Sea fringed coast, from the bustling beaches of Varkala to the isolated sandy stretches and fishing villages of the far north. Of course the backwaters are not to be missed, and Fort Kochi is always worth a day wandering the colonial streets and spice markets. North of here you can escape the crowds in the area known as the Malabar Coast. Kozhikode is much more Muslim influenced than other parts of Kerala with some interesting mosques and unique cuisine. Kannur is the place for quiet beaches and visits to traditional Theyyyam dance performances. In the far North of the state you’ll find empty beaches and historic battlements at Bekal Fort, not far from the border with neighbouring Karnataka state. This entry was posted on Sunday, October 11th, 2009 at 10:55 pm	and is filed under Kerala India Travel, Kerala Suggested Itineraries, Trip Planning Tips. You can follow any responses to this entry through the RSS 2.0 feed. Both comments and pings are currently closed. We aren’t a tour operator, we are just providing advice for people who want to travel to Kerala independently. The cost of 2 weeks in Kerala would depend on the level of comfort you are looking for- it is possible to do it very cheaply or more luxuriously. I’m planning a two week trip to Kerala in September (travelling solo) and the highlights itinerary you suggest covers pretty much everything I’m thinking of doing. I’m not doing it on a shoestring budget but, having never been to India before, I’m not sure how much I should expect to pay to hire a car & driver to get me to/from the places where trains just don’t go. Could you give me a rough idea? Also, I’d absolutely love to travel by houseboat from Alleppey to Kollam but am a bit concerned about the cost when it’s just me – is it usually easy enough to find other travellers willing to share a boat ride? p.s. This website is proving to be my planning Bible so thank you! My parents recently returned from Kerala and they paid 2200 rupees for the 4 hour journey in an AC taxi from the Green Palm Homestay near Alleppey to Kumily (for Periyar) and 3100 rupees from Kumily – Cochin. These are the most common places to get taxis as there´s no train. Hopefully that should give you an idea. I am not sure how easy it is to find other travellers to share a houseboat. Your best chance is to stay in a budget guesthouse in Alleppey (see where Lonely Planet recommends) and ask around. If you can´t find anyone you could take the ferry on that route instead. I’m planning a holiday for 2 weeks in Kerala, I like the Itinerary, Cochin-Munnar-Periyar Wildlife Sanctuary-Alleppey-Kollam-Varkala-Trivandrum. How do we get from place to place? Should I book hotels and lodges before hand? I’m worried that’ll I’ll be stuck in the middle of nowhere. You could either hire a car and driver for part of all of the way, or get buses and trains. It really depends on the comfort you are looking for and your budget. It’s usually not necessary to book hotels in advance – you can always find somewhere to stay and having flexibility is a good idea. However if you have somewhere in particular in mind that you really want to stay you could book. Thanks for your reply, if we were going for 2 weeks, could we just hire someone for 2 weeks? Is it best just to taxi it when we need too? How much would it cost for travel with the itinery above? You could do it either way. It would cost more to get someone for 2 weeks but then you’d have someone to drive you around in your destination. I’m afraid I’m not sure how much it would cost. An example cost is 2200 rupees for the 4 hour drive from Periyar to Alleppey. Ok. Can you just get transport for a 4 hour journey quite easily? Have you got any recommendations for how to source good hotels and travels? I’m getting excited for Kerala! We are planning for 4-5days of kerala trip from Mysore. Can you please guide us for planning. Hi My boyfriend and I are heading to India for 1 month, we will have a week in the north then two weeks in Kerala then a week in Goa. We fly into Delhi and out of Goa. Would you suggest flight from Delhi or Varanasi to Mumbai? Then train from Mumbai to Hampi then doing this itinerary in reverse order? or we could fly from Trivandrum to Goa at the end of our stay in Kelara? It probably makes sense to fly from Delhi to Trivandrum and then travel in Kerala up to Kochi where you can get an overnight train to Goa, or fly if you prefer. Im travelling solo to Kerala in october and will hopefully stay for around 2-3 weeks. I would really like to stay in an Ashram while Im there and have found one based in – Sivananda Yoga Vedanta Dhanwantari Ashram, Neyyar Dam, Kerala. I like the sound of the first itinerary but wondering if I should fit the ashram in before or after?I will be travelling from Goa around 10/11th October and leaving around 28th. I’m pretty flexible on timings. I’ve found this website so useful so thanks very much! The home stay also sounds fantastic. I cant wait!